Ambrose Rachier announced that the launch of Gomalotto will enable the team to raise far more funds than it can raise via sponsorship, membership or Harambees. The goal according to Rachier is to build a clubhouse, a stadium and an academy. Mr. Rachier has been promising to build a stadium since he was first elected chairman in 2008. A noble goal indeed. But if the stadium is built, where will the stadium be built. During the 1990s, then president Moi gave both Gor Mahia and AFC Leopards land on which to build a clubhouse and a training ground. The land was located near Kasarani stadium. Gor Mahia officials of the time held a formal ceremony which in Luo tradition is called “Goyo Dala” which means creating a homestead. The officials even excitedly announced that the next ceremony would be “Goyo Ligala” which means breaking ground on the first home within the homestead. But nothing happened and the land was eventually grabbed by a political bigwig. Gor Mahia and AFC fans appealed to Moi again and he gave them both land at Embakassi. But again nothing was done with that land. It was not even fenced off. The most recent reports suggest that the land is occupied by squatters. If Rachier is serious about his plan to build a clubhouse, a training ground or a stadium, he should clarify what the exact state of that land is. Does the club have the proper title deed? and if not what happened to it. Is it possible to evict the squatters? if the club does not have the wherewithal to evict squatters then a better idea would be to sell the land and instead purchase land in a location where the club can actually build. Just having its own training ground will save the club colossal amounts of money. It was previously reported that Gor Mahia used to pay City stadium Ksh 10,000 per day to train at City stadium for only four hours. This means a training ground could save the club over Ksh 200,000 per month. It would also allow players to spend more time on the training ground which would further sharpen their skills. The training ground can also be rented out to other teams. A gym and a clubhouse can raise money for the club because space can be rented out for various functions. And if the club does eventually build a stadium, they could raise significant amounts unlike the current arrangements where stadiums sometimes take as much as 40% of the gate proceedings. 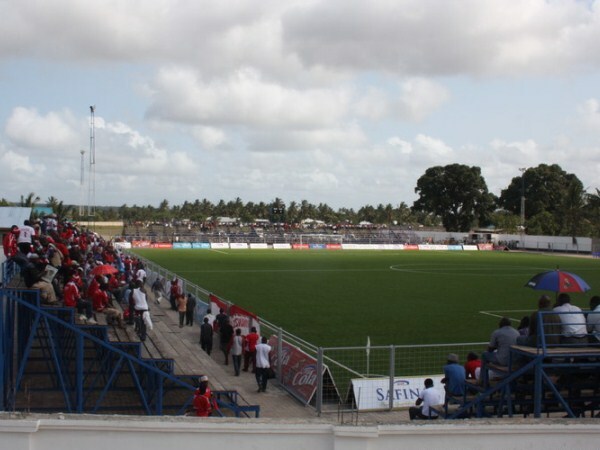 EVEN THE OTHER DAY FKF PRESIDENT DID PROMISE GM LAND AT KASA,THOU MR.OKUL DID HANDOVER THE TITLE TO MR.RACHIER.WHY CANT CLUB BRANCHES BE SHOWN WHERE THE LAND IS SO THAT IT CAN BE FANCED.TRAINING GROUND EVEN WITH PROPER ACCOUNTABILITY AT THE GATE IT CAN BE BUILD,AFRAHA STADIUM IS 9.8M AS IT STANDS MUMIAS IS 6.3M, AZAM STADIUM SHOWN ABOVE IS 17.9M COURSE OF ARTIFICIALTUFF. Getting land for GM is long overdue unfortunately our leaders thrive on promises to stay in power.Please Rachier make this issue a priority,funds are there we can’t hire training ground for decades. Allow me to say this,any talk of a stadium now is utter rubbish but you gave AR the mantle so hold your peace until 2020.Gor members never raised any issue regarding the administration of Omusinga during the just concluded elections/AGM.EC manipulated gullible members to just VOTE,NO QUESTIONS,no report financial or otherwise,no ACCOUNTABILITY.That was the time and forum for such matters and many more to be interrogated.In fact, as is often,I wonder on what basis AR is elected but i and a few are often told AR is the only person who can run GM.Mara GM lotto,GM bread,GM water,GM merchandize,GM Sacco but no accountability.GM is but a cash cow for a select few.In my view let’s concentrate the available funds on strategies to win regional and continental titles. Many clubs have stadiums but very few, Mighty Gor Mahia being one, have ever won a continental title. Why shuld GM fraternity beg for info on land status & training ground.sounds like we are at AR s mercy.What I know he couldnt do it for 8yrs it will be a miracle if he does it in 2 or 4yrs. 1. What is the paybill no? 2. What are the rewards and are how frequent are they? It appears a very shoddy lottery just riding on the goodwill of the Gor Mahia brand. Personally the only safe Gor Mahia product is the match day ticket. The rest seem to be con schemes I personally wouldn’t risk my hard earned little money on any of these GM products apart from the jersey and match ticket. Ambrose Robert (AR) is running Gm like his Kingdom. It is their time to eat. How I wish that they could eat but develop the club at the same time. There are a number of initiatives that started last year. What happened to them? And what happened to the Crown beverages sponsorship? Any/who are GMLOTTO winners since its launch? Hope this ain’t another Kisumu Molasses Plant Saga.The other lottos publish their (bi) weekly winners to prove they are credible ventures not con schemes.Such publicity is what attracts new clients and sustains these lotteries.In an earlier post i had suggested that GMLOTTO be linked to our home match tickets/merchandize making GMLOTTO unique.This will give fans the incentive of buying only genuine tickets/merchandize and also attending home matches.Announce the winners immediately after the end of each home match.Have modest prizes e.g 20k,10k,5k for 1st,2nd and 3rd winners and many consolation prizes say 25 of 1k each.This way GM fights fake ticketing & merchandize while boosting attendance at its matches/merchandize sales.A simple sales pitch BUY A GM MATCH TICKET AND WIN 20/10/5K. Gate collections & merchandize sales can easily fund the prizes. we are having Gor academy by December. Groundbreaking of stadium as was said will be May.It now looks realistic that Gor will build an ultra modern stadium not Afraha or nyayo museums type thanks to Goma lotto and Kenyan gambling culture.Past stadium building plans looked impossible due to lack of revenue source. Dear bloggers gambling Ina pesa na stadium inajengwa from May;remember new club rules.Its better we see how we are going to position ourselves business wise for different stadium facilities or others will benefit. club can buy relatively cheap land in Kisumu Kama ya zamani Ina watu.I hope they build those Gabon type stadium minus running track of course. AR talked of seven acres available land so we hope kazi iaanze by May.Stadium biro,academy biro,Gor biro.This is not poor Gor of 2008.Think of biz opportunities near or in that stadium. I think no I see some of this Gor related projects are doing well.Please let us locate them on social media or even visit them.Someone is lynching Goma loto yet it was officially launched less than a week ago;yawa!. Luophobia is real. Hehehe ati Luophobia is real.Moses, in Gor Mahia? What a nice joke. While we,sorry I,acknowledge,admire and are very proud of Gor Mahia’s heritage,with all its mystic, and its core support base,looking at the current GM team i see:1-luophobia,2-burundiphobia,3-luhya/muslimphobia,4-luyhaphobia,5-muslimphobia,6-luo/rwandesephobia,7-unknown/ugandan/kikuyuphobia,8-kikuyuphobia,9-rwandesephobia,10-luophobia,11-rwandesephobia,coach-sambaphobia,trainer-italianphobia,tm-luophobia,EC-mixed gender phobia.Membership criteria-kes.500phobia.Bloggers-mixedphobia. How some people see everything from a purely tribal prism beats me,but then again it could be the side effects of an election year. Am just looking forward to the stadia this will really benefit not only the club but also the fans.kindly the chairman should also state exact location of the clubs’ stadia. Mr Rachier is not serious about his strategy plan to build a clubhouse, a training ground or a stadium, he should clarify what the exact state of that land is? Management looks easy from outside but it is not a bed of roses when inside. Gor fans should look across the problems our shemejis are going through to know the importance of having a stable running office where employees and players are being paid. The sponsors money looks handsome but players are not cheap so if the office is stable enough to start looking at the possibility of constructing a stadium kudos to them. In any society there will always be those who make too much noise but make no financial contribution to alleviate any problem kudos Kogalo. Even when sportpesa stopped funding the club was still stable.